Chelsea Clinton has let loose on Twitter and embraced her sassier side. But a closer look at Clinton's Twitter account reveals her stances on policy issues. Since her mother's stunning election defeat back in November, Clinton has become more outspoken. She recently co-authored a new book, Governing Global Health: Who Runs the World and Why?, and was subsequently interviewed by the New York Times about her favorite books. News publications have steadily reported on her opinions about current events. This newfound focus on the former first daughter has some speculating that she is preparing for her own career in politics. If Clinton runs for office, a look at her Twitter account will give a preview of some of her stances on various issues. 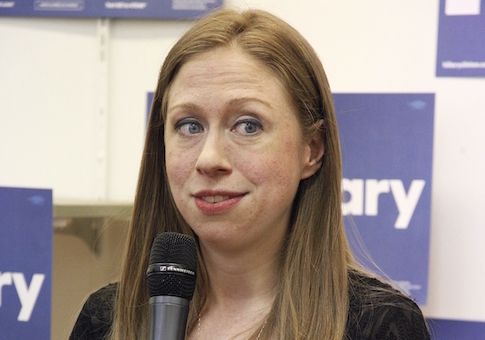 It is no surprise that Chelsea Clinton is against the repeal of Obamacare. Throughout the 2016 presidential campaign, she and her mother, Hillary Clinton, campaigned on enhancing the Affordable Care Act rather than repealing it. While the base of the Democratic Party wants a single-payer health care system, Chelsea Clinton has been skeptical of the idea. During the campaign, she attacked her mother's opponent, Sen. Bernie Sanders (I., Vt.), for wanting to "dismantle" Obamacare and replace it with a single-payer system. Clinton has been a vocal opponent of President Trump's decision to rescind an Obama administration rule that allowed transgender students to use bathrooms that matched the gender they identify with. Unlike her mother, who has a mixed record on LGBT rights, Chelsea Clinton has been consistent in her support for the LGBT community. Clinton has adopted her mother's stance on the issue, arguing that vaccines are essential and safe. During the 2016 campaign, Clinton said it was important that people do everything they can to protect Planned Parenthood and ensure it does not get defunded. Last month, Clinton highlighted the importance of parents talking, reading, and singing to babies while they are in the womb. To consider that life begins in the womb would go against the president of Planned Parenthood's view that life begins when the child is born. Clinton will have to form a clear answer on this question if she considers running for public office. Clinton has wondered how clean water is a controversial issue, but her own family has a murky past when it comes to this topic. When her father, Bill Clinton, was the governor of Arkansas, a chicken plant contaminated water for over 300,000 people by dumping chicken waste into the water supply. Her father took 17 months to declare a state of emergency after people developed chronic dysentery and salmonella. Clinton tweeted against President Trump's immigration policy. She opposes his travel ban, plan to build a wall on the southern border, and plan to deport illegal immigrants who reside in the U.S. Clinton departs from her parents' position to some degree on this issue. When her father was president, he spoke out against illegal immigration and had armed government officials apprehend and deport a six-year-old Cuban child. Clinton wants more protections to help prevent sexual assaults on college campuses and more support for the survivors. She has yet to comment on the sexual assault allegations against her father. Clinton wants pension funds to require companies they are invested in to disclose all foreign government payments, although it was reported in 2015 that her family's charity organization, the Clinton Foundation, failed to disclose 1,100 donations from foreign governments. Clinton is vice chair of the foundation. According to her tweets, Clinton appears to be a proponent of transparency. She has called on companies to disclose all foreign donations and now wants President Trump to release his tax returns. But throughout the 2016 campaign, Clinton did not demand that her mother release all her emails deleted from her private server or transcripts of her speeches to Wall Street companies. Clinton slammed Housing and Urban Development Secretary Dr. Ben Carson for his remarks Monday about African slaves being immigrants. But she was silent when President Obama made a similar comparison in 2015. Clinton thanked the Southern Poverty Law Center, or SPLC, for the work it does highlighting "hate" incidents that occur around the country. But it is unclear if she knows about the group's dubious record. In 2014, the FBI removed the SPLC as a "resource" from its hate crime web page. SPLC has labeled Ben Carson an extremist and the Family Research Council, or FRC, a hate group. After the FRC was labeled a hate group, a shooting occurred at its headquarters. The shooter admitted that he wanted to "kill as many as possible and smear the Chick-Fil-A sandwiches in victims' faces, and kill the guard" after he saw the group was labeled a hate group. Clinton joined fellow Democrats in mocking Education Secretary Betsy DeVos' comments about rural schools having firearms in case bears threaten the school. They laughed at the idea of bears being able to threaten schools, but earlier this month, a bear sighting caused two Connecticut schools to go into emergency mode.